As a San Francisco accident law firm, we know that there are many reasons for accidents. We find it particularly upsetting when the accident is caused by a known threat such as a brake problem a repair shop failed to address. This can be made even worse when the accident has tragic and catastrophic results, such as a major bridge collapse caused by known deficiencies. While the collapse is imagined, the possibility of a span with known problems appears to be all too real. It is the type of tragedy that should be prevented and that can give rise to municipal liability if the tragedy is allowed to occur. The San Francisco Chronicle reports that both an engineer with Caltrans and an outside expert have accused Caltrans of ignoring warnings about cracked welds on the Bay Bridge. Further, the engineer says officials told him to refrain from putting his concerns in writing to prevent the objections from being publically available. The current charges are separate from problems with steel fasteners discussed on this blog previously. Caltrans denies the charges and says the concerns were properly addressed and the welds approved by an outside panel. California legislators are looking at the new objections, with State Senator DeSaulnier vowing to reform the culture at Caltrans so that it serves the people of the state. One witness, James Merrill, is expected to say his firm was replaced and told they were overly rigorous when they rejected cracked welds from a Chinese contractor. Merrill is likely to suggest the Chinese company lacked the necessary experience for the project and that Caltrans was risking safety by relying on the company’s product. Additionally, an audit suggested the firm that replaced Merrill’s may not have been qualified but the audit never moved beyond a draft form. The objections that kept the report in draft form ensured it would not be made available to the public. On a similar note, Merrill says that an official overseeing the Bay Bridge work, Tony Anziano, told him not to put his concerns in writing so that there would not be a public record of his objections. A Caltrans engineer who objected to the welds, Douglas Coe, also said he was told not to put his concerns in writing. While both Coe and Merrill say the welds do not render the bridge unsafe, that the issues just require special and increased maintenance, it is important to investigate these claims given the sheer volume of traffic expected to cross over the bridge. Should something go horribly wrong, should a collapse occur because of the failure to take heed and do the proper maintenance, Caltrans may be liable. This is also true should a more minor problem occur, like a fraying weld leading one car to get a flat and crash into another, a scenario likely to end up in a multi-car crash given the tight traffic expected on the bridge. Perhaps the bridge would be fine until many years passed and a major earthquake hit the region, leaving behind an all-too-familiar scene. Caltrans may be liable in those cases as well, especially if the plaintiffs can prove the city knowingly and willfully ignored warnings. We don’t know the truth, but we hope the legislature will push hard until they uncover it. Californians deserve a safe span, especially given the time and money invested in its construction. We hope that the eastern span never sees a horrific accident of any sort, particularly one that could have been avoided. We are a law firm for preventable accidents in San Francisco and all of The Golden State and we are prepared to help should a tragedy occur. 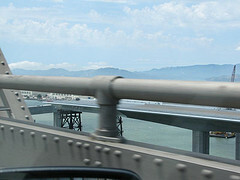 However, we are also Californians, people who rely on bridges such as the east span. We want, we deserve, the truth.